In 2001 having started the process of designing & constructing the Sunpendulum Station PHI , i.e. 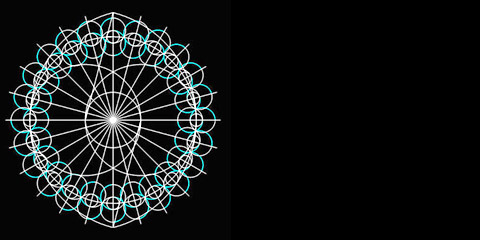 a pavilion for the circle of the 12 Time-Screens transmitting online the sky images of the 12 Time-Eyes from the 12 time zones, I have discovered a series of fascinating new constructions of the Golden Section just using ruler and compass or compass only. These discoveries have been published in Scientific Journals - see below. The geometry of interpenetration - achieved by 2 circles, which are translated parallel by their radii - formulates a specific transition between inner and outer space; outside turns inside and inside outside. 24 pairs of half-cylindrical panels, translated by the radii of their semi-circular cross sections towards the center, are setup in a circle and form the entries from all directions. The requirement to optimize the light situation in the pavilion for the screens yields the premise: “No direct light beam is allowed to enter the inner space“. Therefore the adjacent panels have to touch each other. The optimization of their semi-circular cross sections is directly derived from the principle of the Golden Section and can easily be constructed by only using a set of compasses and a ruler. In 2003 deeply stimulated by these fascinating simple constructions I started to study on creating patterns and tilings. Using and extending the constructions I have developed sculptures and a cycle of works called PHI STRUCT TILINGS. In 2008 I have discovered a new method of generating vivid patterns - called THE INDUCTIVE ROTATION.